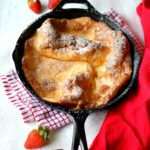 Dutch Baby ~ One of the most interesting ways to eat pancakes! Yes! This one came to my notice when my son was scanning YouTube for some breakfast recipes and he was so fascinated by Chef John’s (of Foodwishes) way of making them, especially his narrative that we wanted to try it out immediately. This was something new to us as the pancakes need you to cook the batter over a high heat in a skillet before it is popped into the oven to be baked until fluffy. So this had to be our Friday morning experiment as it does take a good 30 minutes from start to finish. 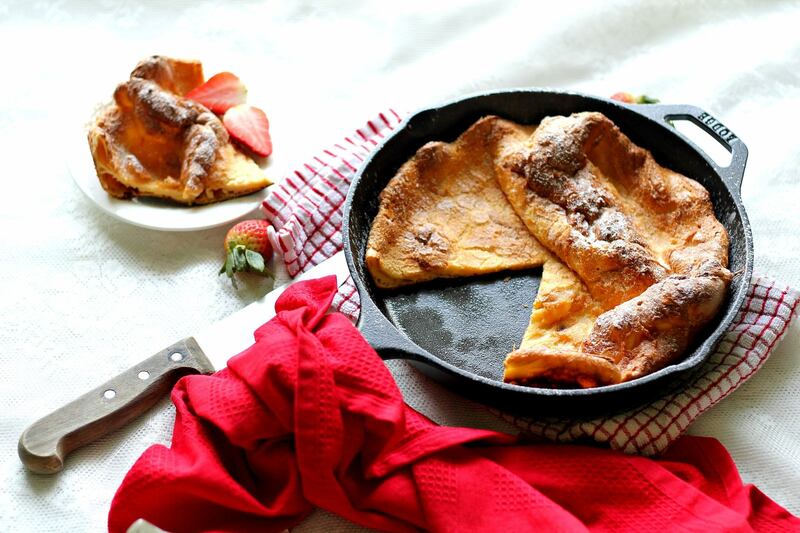 If you have a cast iron skillet or pan you must make this! What you see in the pictures is Lodge Seasoned Cast Iron Skillet – 12 Inch Ergonomic Frying Pan with Assist Handle . (Indian buyers – please check this link Lodge L6SK3 Cast Iron Skillet, Pre-Seasoned, 9-Inch ) If you are a Mangalorean reading this, you can make this in your neer dosa skillet! Just make sure you know how to handle the super hot skillet when it comes out of the oven as it won’t have a long handle like the one you see in my pictures. Ever since we first made it a couple of months ago, this baby has become a regular on our weekend breakfast menu! While I generally like to serve it as suggested – with lemon juice & icing sugar I am very keen to try it with maple syrup or honey the next time I make it. I hope you give it a try & let me know how you like it! 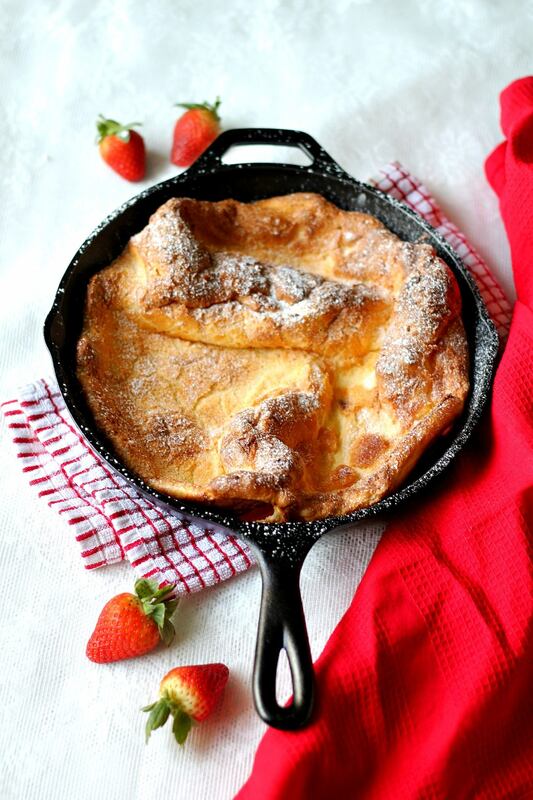 Dutch Baby ~ A delicious way to eat pancakes! 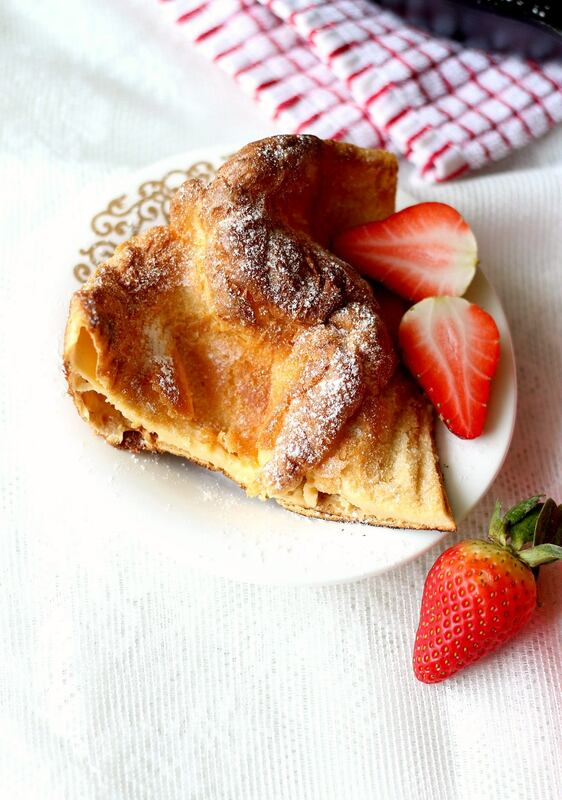 Bake it, dust it with lemon juice & sugar and enjoy a cross between a custardy crepe & a pancake! Preheat your oven to 220 degrees C or 425 degrees F. The oven should be hot & ready when you are at the stage of heating your skillet. Heat a cast iron skillet on very high. The skillet should be very hot. Add the ghee and swirl the skillet so that the surface of the skillet is covered with the ghee. Pour the batter into the centre of the skillet and you will notice the mixture bubbling up quickly. So it is essential that your skillet be properly heated before you begin. Pop the skillet into the preheated oven and bake for 20-22 minutes or till the surface looks well risen and golden brown. 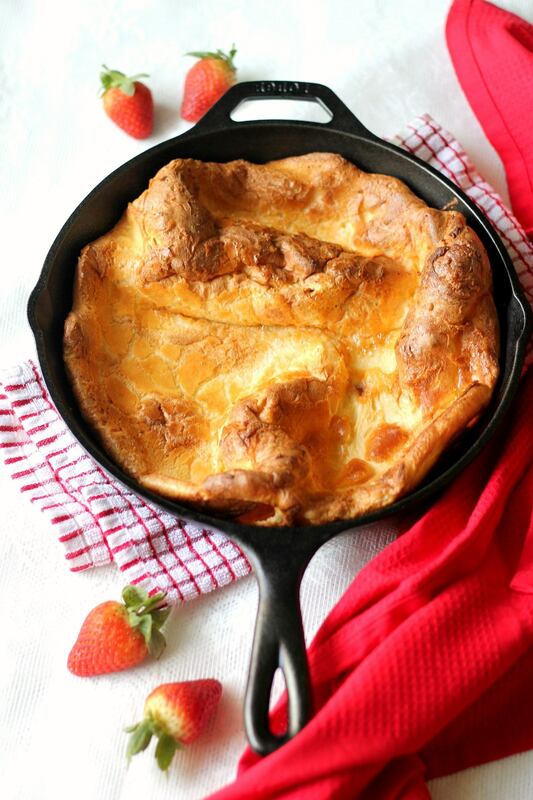 Cut, serve and enjoy this delicious Dutch Baby immediately! Where did you get that skillet from? 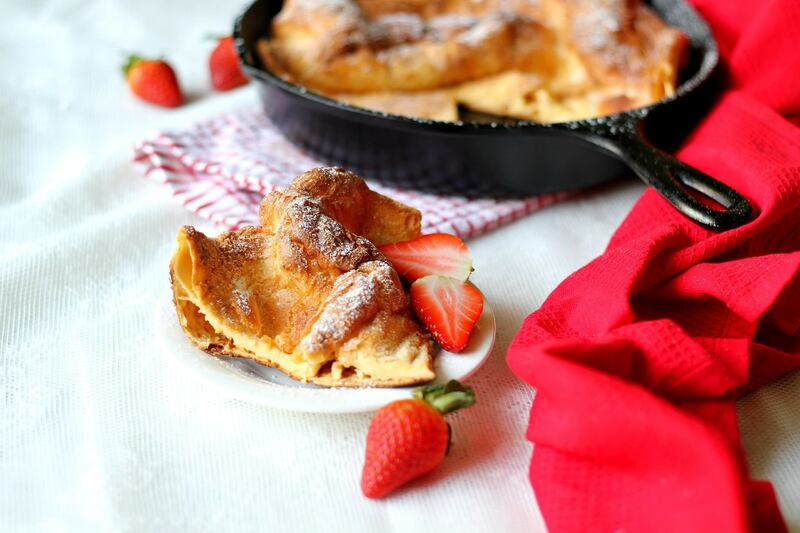 You could add a few pieces of sliced apples tossed in cinnamon & sugar (basic apple pie filling) with the batter before poring it into the skillet..gives that crunchy texture in the middle of all that fluffiness ! ..
Oh that sounds fantastic! I will definitely add some sliced apples next time!